Last week I found a Security flaw on Dreamhost caused by the User Experience on their control panel. I couldn’t find a security email, so I posted a message on Twitter. Their Customer Support team reached out and assured me that an email response would be addressed. Six days later I’ve heard nothing from them, so I feel forced to do a public disclosure. I was hoping that they would do the responsible thing, and immediately fix this issue. If you create a Subversion repository, there is a checkbox option to add on a “Trac” interface – which is a really great feature, as it can be a pain to set up on their servers yourself (something I’ve usually done in the past). The exact details of how the “one-click” Trac install works aren’t noted though, and the integration doesnt “work as you would probably expect” from the User Experience path. If you had previous experience with Trac, and you were to create a “Private” SVN repository on Dreamhost – one that limits access to a set of username/passwords – you would probably assume that access to the Trac instance is handled by the same credentials as the SVN instance, as Trac is tightly integrated into Subversion. If you had no experience with Trac, you would probably be oblivious to the fact that Trac has it’s own permissions system, and assume your repository is secured from the option above. The “one click” Trac install from Dreamhost is entirely unsecured – the immediate result of checking the box to enable Trac on a “private” repository, is that you inherently are publicly publishing that repo from within the Trac browser. The /svn source would be private however it would be publicly available under /trac/browser due to the default one-click install settings. I totally understand how the team at Dreamhost that implemented the Trac installer would think their approach was a good idea, because in a way it is. A lot of people who are familiar with Trac want to fine-tune the privileges using Trac’s own very-robust permissions system, deciding who can see the source / file tickets / etc. The problem is that there is absolutely no mention of an alternate permissions system contained within Trac – or that someone may need to fine-tune the Trac permissions. People unfamiliar with Trac have NO IDEA that their code is being made public, and those familiar with Trac would not necessarily realize that a fully unsecured setup is being created. I’ve been using Trac for over 8 years , and the thought of the default integrations being setup like this is downright silly – it’s the last thing I would expect a host to do. I think it would be totally fine if there is just a “Warning!” sign next to the “enable Trac” — with a link to Trac’s wiki for customization , or instructions ( maybe even a checkbox option ) on how a user can have Trac use the same authorization file as subversion. But, and this is a huge BUT, people need to be warned that clicking the ‘enable Trac’ button will publish code until Trac is configured. People who are running Trac via an auto-install need to be alerted of this immediately. This can be a huge security issue depending on what people store in Subversion. 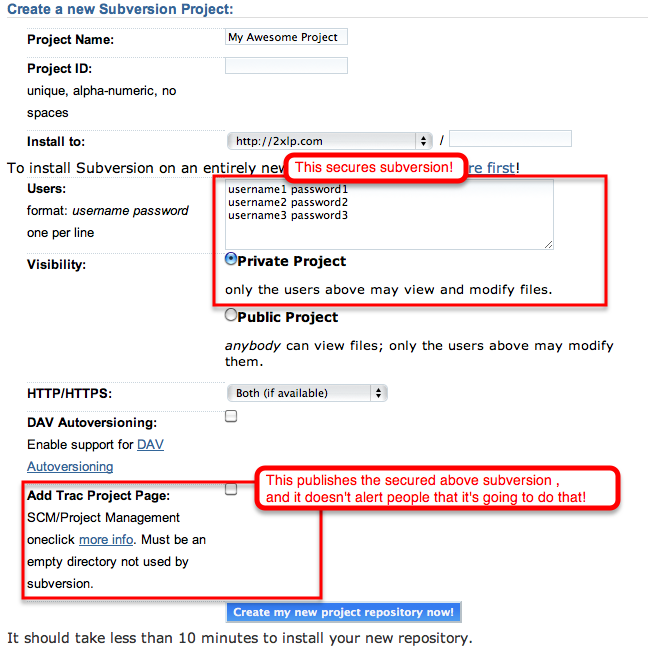 Code put in Subversion repositories tends to contain Third Party Account Credentials ( Amazon AWS Secrets/Keys, Facebook Connect Secrets, Paypal/CreditCard Providers, etc ), SSH Keys for automated code deployment, full database connection information, administrator/account default passwords — not to mention the exact algorithms used for user account passwords. ### Audit your affected code and services. * All Third Party Credentials should be immediately trashed and regenerated. * All Database Accounts should be reset. ## What are the odds of me being affected ? Someone would need to figure out where your trac/svn repos are to exploit this. Unless you’ve got some great obscurity going on, it’s pretty easy to guess. Many people still like to deploy using files served out of Subversion (it was popular with developers 5 years ago before build/deploy tools became the standard) , if that’s the case and Apache/Nginx aren’t configured to reject .svn directories — your repo information is public. When it comes to security, play it safe. If your repo was accidentally public for a minute, you should wipe all your credentials. Just checked my trac/subversion system hosted with dreamhost, and your correct, any joe blogs can go and click browse source to view all my code… Not good!! What a Product Manager Is and Isn't, and Why You Should Probably Stop Trying to Hire One.